Old map by GIBBS -Architectural Iron Fence & Gate by Gibbs. Title: Architectural Iron Fence & Gate by Gibbs. 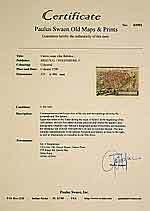 Size: 1.1 x 1.8 inches. Condition: In very good condition with some age toning. 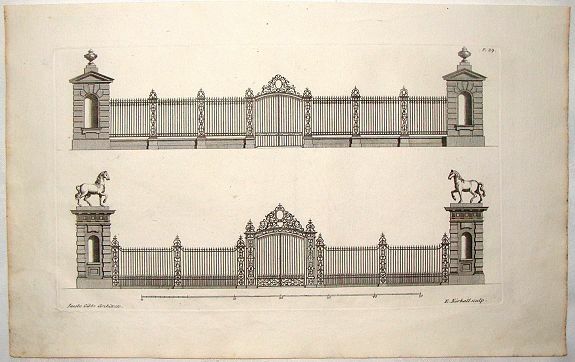 Fine architectural copper engraving of an iron fence and gar . It was engraved by E. Kirkall. James Gibbs (1682 – 1754) was one of Britain's most influential architects. Born in Scotland, he trained as an architect in Rome, and practised mainly in England. His most important works are St Martin-in-the-Fields, in London, and the cylindrical, domed Radcliffe Camera at Oxford University.